This little bottle contains half pearl shapes. I placed them over Color Club Blue-topia. I poured a few of the pearls out and turned them the right way round. I then placed them on the wet nail - I used a top coat then quickly placed them on the wet top coat and gently pressed them down. I used a pair of tweezers to lift and place them onto the nail one at a time. I do really like this look. I only wore this for a few hours and found myself picking at them! Too tempting not to. I was pleased with the end result. Pearls on the nails are no good for me. Keyword: picking ;DDD. It looks great :) I sometimes touch such things, f. ex. rhinestones when I wear them. 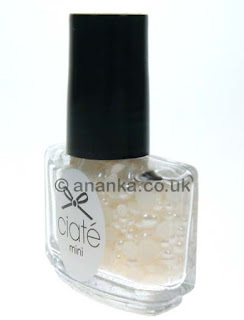 Ahh so pretty, Ciate is one of my favorites.